By Sam Smith | 3.17.2016 | 9:20 a.m.
Teachers understand this syndrome best. You make it so simple, go over it and over it and over it, almost tell them what’s going to be on the test, the questions and the answers. And then half the kids flunk. What the heck were they thinking about? And so another test failed for the Bulls, who in their supposedly urgent playoff quest seemed to be thinking more of summer vacation. 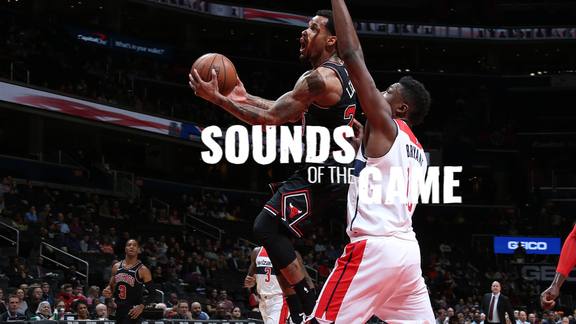 With a chance to maybe knock out one of the teams chasing them for the final playoff spot after the impressive Monday win in Toronto, the Bulls, instead, gave the Washington Wizards life and momentum in a runaway Washington 117-96 victory. The Bulls, 33-33, hung onto a tie for eighth in the Eastern Conference with Detroit’s loss to Atlanta. But the Wizards, who also gained the tiebreaker over the Bulls, moved to 32-35 as John Wall had a triple double with 29 points, 12 assists and 10 rebounds. Wall also had eight turnovers, but it didn’t much matter as the Bulls committed 18 for 23 point and trailed by double digits the entire second quarter in never making a run and suffered yet another injury loss. New center Taj Gibson, with Pau Gasol out, aggravated a tight hamstring and pulled up shortly after returning to the game with 4:56 left in the second quarter in a 45-45 tie. Shortly thereafter, Gibson grabbed at the right hamstring he said bothered him in Toronto and came out. He didn’t play the second half. Hoiberg said he would be reevaluated back in Chicago Thursday, but doubted Gibson would play against the Nets. Similarly, Hoiberg acknowledged Gasol probably is out through the weekend with swelling in his knee. And Mike Dunleavy didn’t look right in his return from the flu, scoreless in 18 minutes with three fouls. That left rookie Bobby Portis and Nikola Mirotic to open the second half as the Bulls interior power with the Bulls trailing 63-52. The Wizards had a 17-point lead within two minutes and pretty much made it look like a light practice the rest of the way with 25 fast break points. Hoiberg also said Cameron Bairstow is unavailable with a bad back, leaving Cristiano Felicio, who has two points in 23 minutes the last two games, as the primary big man coming in. Hoiberg said it’s possible the Bulls will have to go to a small ball type of game with the likes of Doug McDermott, who led the Bulls with 20 points, playing more power forward, perhaps along with Jimmy Butler. Butler had 17 points, Derrick Rose 16 points and Justin Holiday another solid effort with 13 points and six rebounds. But it’s also obvious Butler isn’t quite confident in his return from a knee injury. Butler has had two of his poorest games of the season, shooting a combined nine of 30 and zero for four on threes. He was the only starter in Toronto with a minus rating in the plus/minus statistic and was by far a team poorest minus 26 Wednesday. Plus, the Bulls made their only sustained run Wednesday to start the second quarter without him. 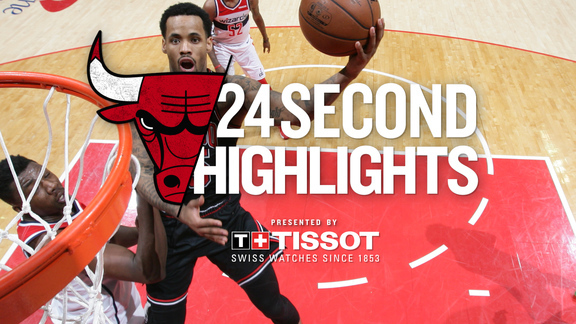 After trailing 32-25 in the first quarter as the Wizards pushed back at the Bulls at every opportunity, the Bulls took a 43-38 lead four minutes into the second quarter on a combined 21-6 run behind McDermott’s shooting and Rose’s driving layups. Butler then returned and within five minutes the Bulls were trailing 53-45, and then got a three-point play from Gibson. But then Garrett Temple made a pair of threes off Wall passes among Temple’s five in the first half and the Bulls never would get their deficit into single digits. “Terrible,” Butler volunteered about his play. “Can’t make a shot, as you can tell. It will come. I didn’t expect it to come right away, but I need it to come sooner rather than later. I have to produce. That’s why they got me here. So if I’m out there, it doesn’t matter if it’s bothering me or not. I’ve got to play basketball. But it obviously remains an issue as Butler has lacked his usual ability to get past defenders and get fouled. He took long stretches on Wall with little effect, as well, as the Wizards were quicker, more aggressive and accurate with 13 of 21 threes. But Wall got them so many open looks with his penetration and passing. The Wizards in 10th place now trail the Bulls by just 1.5 games. “Just weren’t disciplined,” Butler commented in a refrain heard among all the players blaming themselves. “We knew make or miss they were going to push the ball, get to the paint, kick it out for threes and they made shots. We’ve been down guys all year, so you can’t continually blame it on the personnel. You’re short guys you still have to get back, still have to guard, take away the three, rebound. We didn’t do any of that tonight. But Butler wasn’t giving up hope or optimism with 16 games left and now a crucial stretch for that playoff possibility with four consecutive home games against teams with losing records and, overall, six straight games against teams with below .500 records. And Hoiberg knows the team needs Butler. So there is time, though tick/tock, it’s speeding up as the Bulls more resemble a swimmer in trouble, bobbing up and down, gasping for air and help as the surface is that .500 mark. They’re determined not to go down, but just how much strength is left? It seems unlikely this season a record below .500 will be good enough to get into the Eastern Conference playoffs. So this sets up as a crucial next 10 days. Because after that seven of the following eight games are against teams with winning records and half of those on the road. They didn’t look like it at times in Washington where, like some of the presidential contenders, they’re in the race but running out of mathematical possibilities. There wasn’t much to break down but more Bulls. Rose had some good stretches in his return from missing two games with a hamstring strain. That stretch also featured another big burst from McDermott, who had 13 points in 12 first half minutes. Hoiberg admitted they didn’t do a good job finding McDermott after halftime as he played six minutes in the third quarter without a shot as the Bulls fell behind 92-74 after three. But Hoiberg noted the subtlety that doesn’t show up in the analytics, like Gibson picking off a defender in transition. There was no Gibson after halftime. That’s with Gasol’s shooting that can slow the pace when teams are scoring in bunches like the Wizards did. And clean up those misses and put them back like Gibson has. Which now may take some different looks, even an extreme version of the speedball Hoiberg has talked about at times. After all, with Joakim Noah gone, Gibson out and Butler slowed, that’s your defensive core. Perhaps very small ball with shooting and just try to outscore them. Maybe just take your five best players left standing and see what they can do. “I think it can be good for us, especially on offense,” said McDermott, 15 for 21 the last two games (seven of 11 on threes) for 49 points in 66 minutes. “We can spread the floor a little more and they’re going to switch a lot of screens on me. So they’ll get Aaron (Brooks), or Derrick or E’Twaun (Moore) a big guarding them. I think it can be really effective. Which is the only way to truly learn.